Best Ideas How To Wear Capri: One of the most controversial fashion trends to have made a comeback in the year 2018 has to be the Capri Pants. They happen to make for great casual bottoms to wear for a Day out or a chill day at work. There are different ways to style a simple Capri pant and we bring you our best picks. 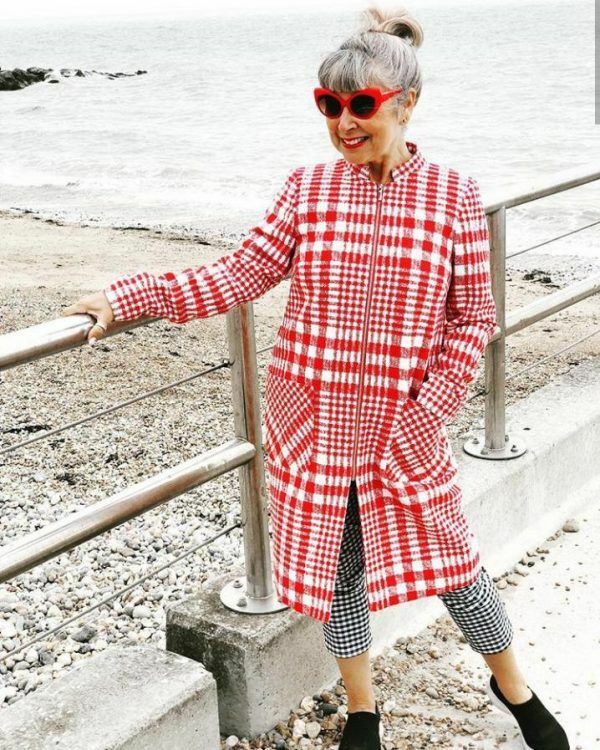 The Fashion World makes little to no contribution when it comes to fashion choices for Seniors. There are not many options to choose from without appearing like one is trying to look younger than their actual age. 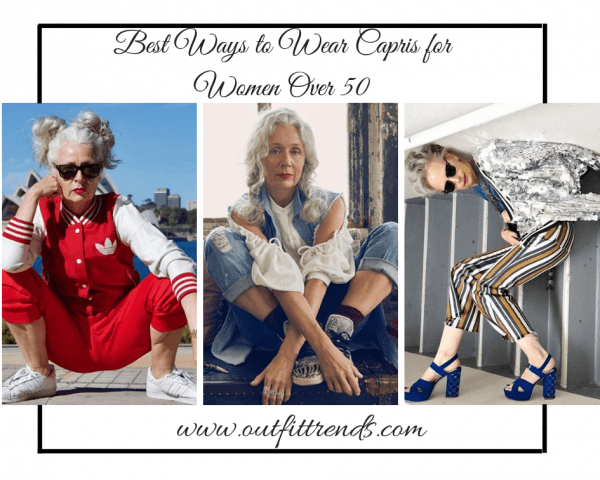 What to Wear With Capri Pants in Your Fifties? Despite being a simple piece of clothing, Capris are not so easy to style. Getting the right fit, length, and color is definitely not an easy task. Wide-legged Capris are known to make one look square, short and flabby if not styled appropriately. For one, the right length for Capri Pants depends on the part of the leg one would want to show off the most. Skip the Flip-flops and flats if you wish to appear taller in your Capris. Make sure to try it on before making the purchase. Let us know what you think of our choices below. 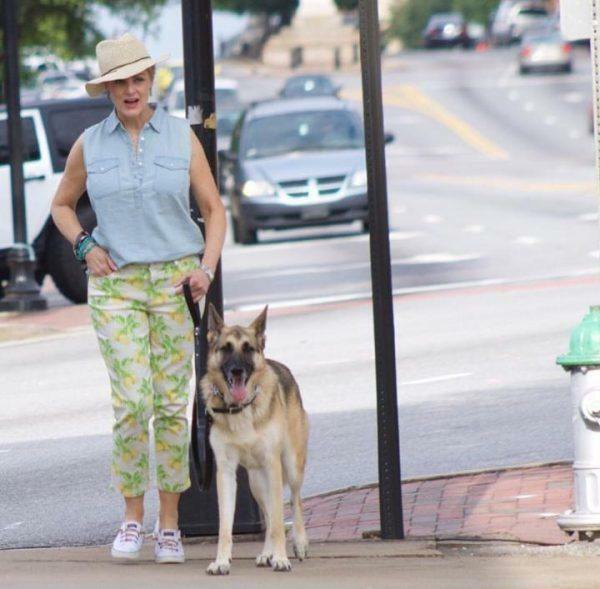 Despite being debatable, Crop Tops can be worn by women over 50 who do not mind defying age-related Fashion Rules. They can be great to create outfits that are casual yet chic. However, there happens to be a limit to skin-baring when it comes to crops tops and Capris. Showing excess skin is known to make a person look smaller. Although a great way to flaunt the abs, it is important to ensure one does not look too petite in such an outfit. Showing a hint of the Torso is a great way to wear them with Capri Pants. 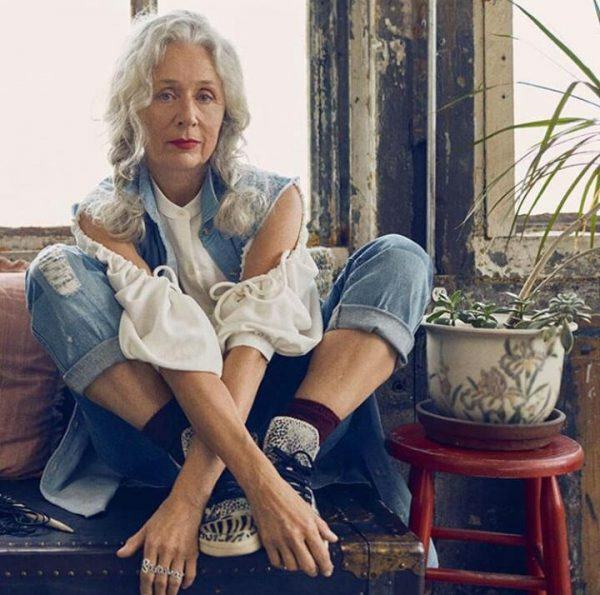 Have a look at these 20 Best Outfit Ideas with Jeans for Women Over 50. Sporty outfits featuring the Capri Pants can be comfortable to wear. However, it does become difficult to style them in a way appropriate for the outdoors. We find cardigans a great tool in trying to lift up a comfortable attire. Floral, block colors or tassel embellished cardigans, all seem like great options. 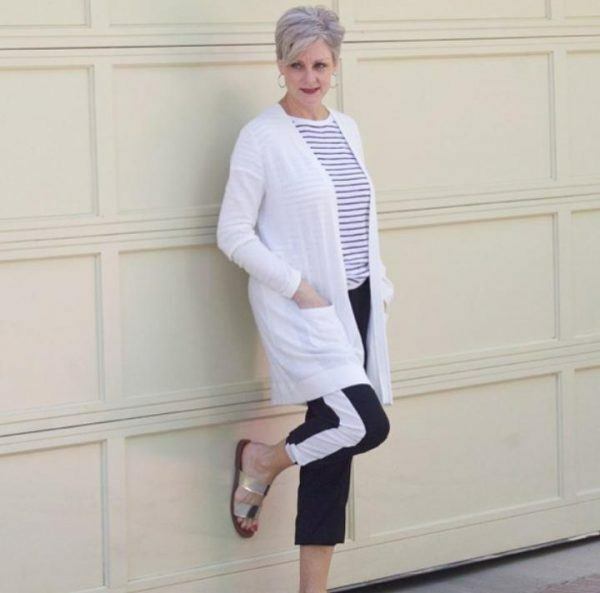 The white Cardigan styled by Beth Djalali over these striped Track Pants is the way to do. The monochrome look happens to be a very safe choice and a great one at that. We all have those days where all we want is to put over a plaid shirt over cropped pants for a lazy day in or out. Plaid shirts are an all-time classic and never go out of fashion. The highlight though is the number of ways in which it can be styled. From wearing it over T-shirts and Tanks to tying it around the waist – there are endless choices when it comes to plaid shirts. An All Black look is easier to pull off than imagined. The Queen of Colors, Black, is sure to bring you the spotlight wherever you go. With the right techniques, anyone can own the look. A great plus point is also how it makes one look skinnier than actual. For people fearing to wear an all-black look can go for accessories that add a bit of color to the look. Bright colored heels or handbags can be the right tool to ace the look with just the right pop of colors. 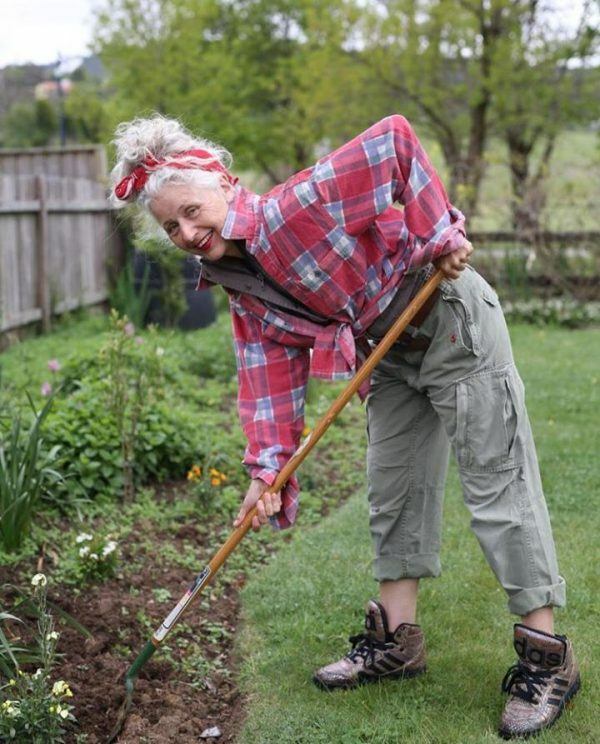 Do check out these 10 Most Productive Hobbies for Women Over 50. Despite having been overdone by many, a minimalistic Denim on Denim look can go many miles. Opting for different washes of Denim, that compliment each other, can be a great way to do the trend. It is essential to throw in a neutral color that allows the Denim to overpower it. We have fallen heads over heels in love with this chic look sported by Sarah Jane Adams. The Statement Sleeves, that fall right above her elbow, are given great space by putting it together with a basic sleeveless denim top. The folded hem on the Capri Pants is a great way to bring the focus to the part of the legs you want to show more. Paired with sneakers, the look is great for a casual day out. Printed Patterns or Florals on Pants are a different take on Fashion, one that we really love. It is quite simple to style these bottoms with Solid Colors like Pastels and Neutrals. 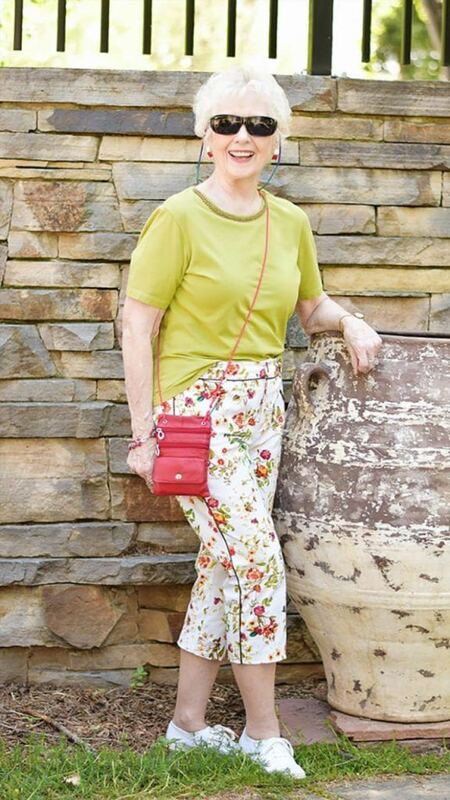 Florals can be donned to represent a Spring or Summer look while Patterns are easier to carry all-year-round. Printed Capris can be worn with both T-Shirts, as well as, Button-Down Formal or Casual Shirts. Apart from being a very trendy pick, Stripes are a great way to do Capris. The consequences of wearing cropped pants are appearing of short h7 Though, this can easily be countered with vertical stripes that are a great way to appear taller. The Mustard Stripes have very well been paired with Electric Blue Block heels to bring in an edgier look. Despite sounding like a weird combination, the two seem to go well together. Individuals living in colder weather can not simply abandon their Fashion Game during Winters. A great example of it is how well it has been done by Suzi of Alternative Aging. We love the bright red, patterned coat over the patterned bottoms. Doing patterns over patterns becomes very tricky and often ends in a disaster, but not here. We can not help but admire Suzi’s confidence as well as the choice of accessories that seems to be doing the job for her. She does not fear to make difficult choices, pairing items that usually do not go together. With a smile like that, she can turn any fashion risk into great success. Keeping a cool look while running around the block, or hitting the gym seem like a difficult task. But we have a feasible solution for you. Track Pant Capris are the new it thing and we are adoring the fashion trend. For the longest, Capris have been around as Printed or Denim Pants. The new trend gives it a new outlook altogether. A striped or a plain track pant is easy to pair with T-Shirts that can do the speaking for you. A Graphic Tee or a Basic Coloured one can do the job well, helping you stay in, both, style and comfort. 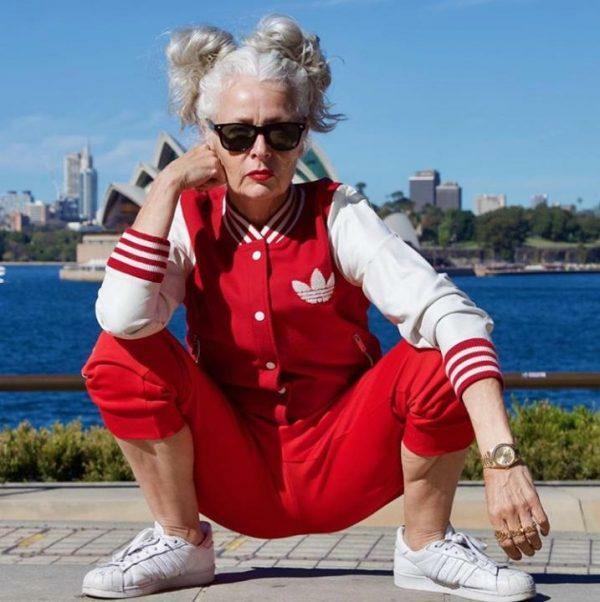 We spotted Sarah Jane Adams donned in an Adidas Track Suit with a cropped hem, giving the legs ample breathing space. The entire look seems to be going great with the basic white sneakers and black sunnies. Here are 30 Best Winter Travelling Outfits for Women Over 50. 2018 has been big about Pastels and Ice Cream Colors. Mint Greens, Powdery Pinks, and Lavenders have all trended as the ‘it’ colors. The shades have a soothing story to tell and can be paired well with neutral shades like whites and greys. We personally find Blues and Pinks to go well with Older People. Beth’s unique take on them is impressive, to say the least. The Pastel Blue Tank Top is complimenting her printed Capri Pants well. The yellow adds just the right amount of brightness to her very casual look. Fashion comes and goes, but certain classics remain. Since change is the only constant, these classics also go through some rebranding or reimaging before appearing in a new, but old way. Camouflage happens to be one classic that has been invented and reinvented in different ways. The print is commonly worn whether as Shirts, Jackets, Pants or simple accessories like caps. It happens to be a wardrobe necessity for days when you just want the old 90’s look back. The look below has been kept very simple with a bright yellow colored bottom and a bag to keep the contrast going. 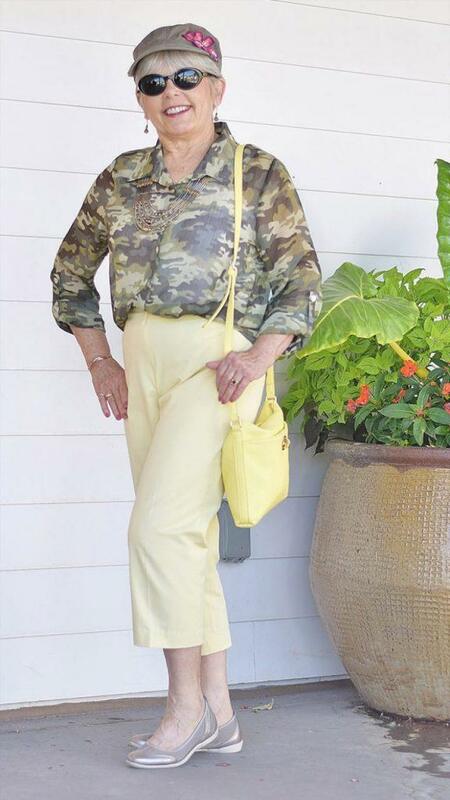 Camouflage shirts and bottoms can be paired with different colors depending on what looks great with it. The color white quietly exists in the wardrobes and is easy to style in a number of ways. A simple game of mix and match can go a long way when it comes to this neutral shade. Pairing tops and bottoms of the same color can be tricky yet very simple. The key is to pair the exact same or quite similar shades that compliment each other well. With such an outfit, a pop of color here and there can easily help you score the look. Beth does it coolly with a striped shirt over basic white Pants. The look has been finished off with black heels and a handbag. We find Long Shirts to compliment Capris the best. The style was previously dominant in the South Asian Culture and has recently been adopted in the West. Beth styles her Black Long Shirt with Jewels that add the right accents to her looks. The length of the shirt and the Capris somehow accentuate her slender figure. Capri pants are usually fitted all the way down and are cropped below the knee. However, one recent trend is the wide legged Capri Pants that are perfect for a Business Formal Attire. A tucked in blouse or a fitted shirt is a great option to pair them with. Pair your wide Capri pants with heels to add more flair to your entire look. The Purple and Beige seem to be complimenting each other well. The addition of the bright yellow handbag seems to be a great one. 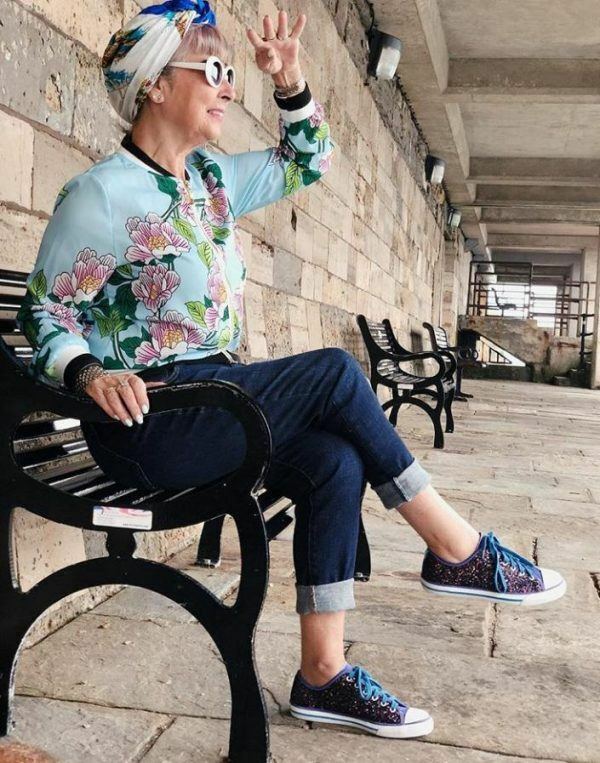 Don’t miss out these 30 Best Summer Travelling Outfits for Women Over 50. Floral Prints are one of those classics that can be done in numerous ways. But nothing beats the old classic of floral print shirts and denim pants. A slim fit Capri pant is a great piece of apparel to invest in, for the numerous ways they can be worn in. The Summer favorite is a great way to stay in comfort during a stroll outside or a chill day in. Suzi adds her personal elements through the glittery converse and her usual headgear that tells us fashion never has to be age-appropriate. 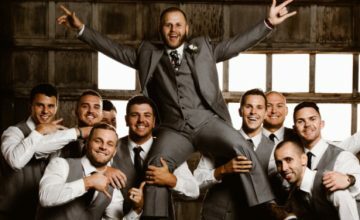 It only comes down to how well one carries themselves with just the right amount of confidence. Yellow is an all-time favorite color and has always been announced the color of Fall/Winter 2018. Now as a wardrobe essential, we could not help but include it in our list of outfits. 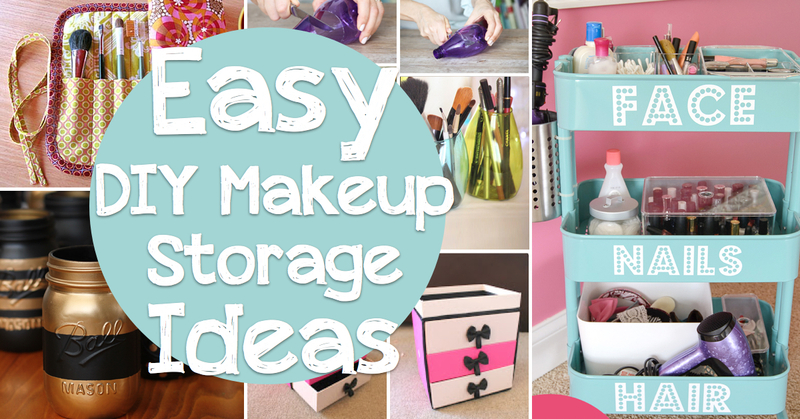 The color can be used to add just the right amount of brightness to your everyday look. 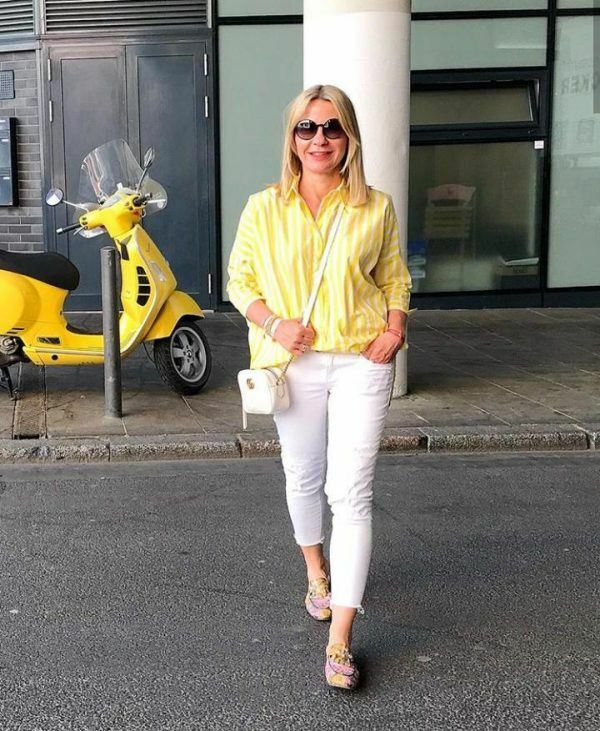 This striped bright yellow top, paired with a white pant is a great take on the fashion trend. Tucked into the pant, it creates the perfect silhouette. With a bright top like that, it is easier to shift the attention to the upper body for times when one wants to refrain from showing off the legs. We have all heard of the plaid style shirts that we adore endlessly and never miss a chance to style. Now it looks like that checked pants are here to steal its thunder. The look is street style perfect and makes us want to immediately hit the stores. The light colored pant seems to go well with the bright colored sweatshirt, keeping comfort and style intact. 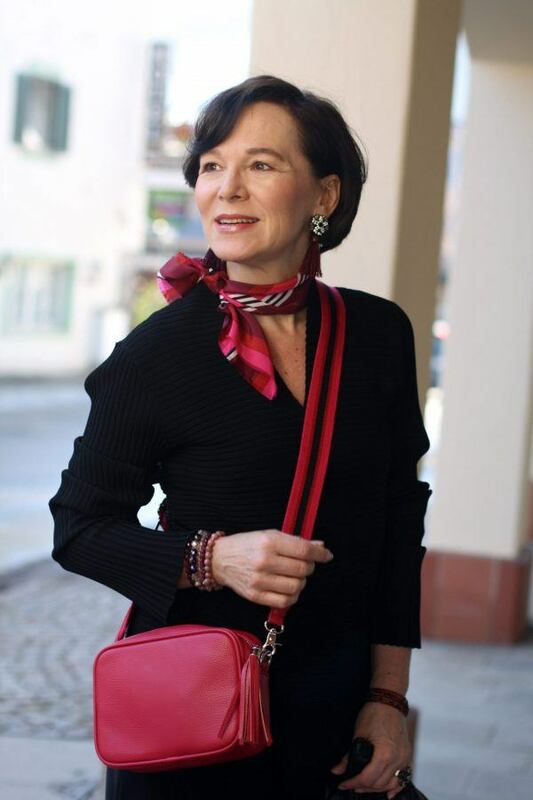 The red Gucci bag earns a brownie point from us. Capris do not have to be simple or mere printed pants. Embroideries, Sequins, and embellishments are all widely done on pants and are now being incorporated on Capri Pants as well. This particular set of White Capri Pants with buttoned hems are different yet very classy. Paired with a bright and striped loose cardigan, the attire is great for a day out with friends in the Summers. The wide legged capris are trendy on their own and the buttons add a bit of glamor to the whole look.